The Watersong Series began with a bang as Amanda Hocking’s first never-before published novel, Wake, hit stores. In Wake, Hocking introduces readers to the two sisters, Harper and Gemma, whose relationship is put to the test when Gemma is targeted, and forcefully recruited, by three strangers who appeared mysteriously in their small town. 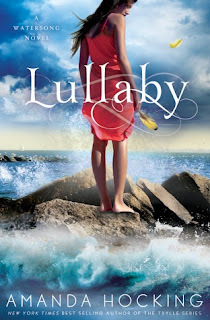 The story resumes in Lullaby as Harper deals with the aftermath of Gemma's running away with Penn, Lexi, and Thea. Her friendship with Daniel becomes strained as she pushes him aside to search for Gemma, researches who Penn, Lexi, and Thea might be, and why they lured Gemma away from their family. Meanwhile, Gemma is stuck with the sirens and hoping against all hope that she can reject their violent nature. Penn, Lexi, and Thea’s background story is lightened with a few more details, but it only serves to prove to Gemma that she doesn’t belong with them. The progression of Lullaby is just as it was with Wake. Alex, Harper and Daniel struggle to make sense of the myths and legends they discover while they all feel the pressure of what danger lurks for Gemma, and them. The plot builds to what could’ve been an explosive conclusion. With only an advanced galley to go on I won’t go into too much detail, as scenes might change, but Wake offered readers a surprising twist and stronger taste of the paranormal as Harper faced down Penn, Lexi, and Thea before they stole off into the sea. Lullaby also comes down a tension filled Mexican standoff-like scene; this time Harper doesn’t stand alone against the sirens. It was slightly disappointing, to say the least, because it was just too easy after the novel built up so much tension and an aching for some hard-hitting action. However, my faith is not lost in this series as I believe Hocking may have some pretty big tricks hiding up her sleeves for the next installment, Tidal. Different sides of the characters arise, as well. Alex is so clear about his feelings for Gemma, and Hocking expresses his feelings with few words to lend to his sincerity. When it comes to the romance in this series, it’s not cheesy exclamations or a spill of romantic clichés that make readers swoon, but the simple realness of the characters who know who and what they want. A softer, more insightful, side of Harper emerges as Daniel prods her to open up. Gemma, caught between her family and three evil girls, learns to stand up to Penn, Lexi, and Thea, to some degree, while fighting her new body to stay alive. Lullaby wasn’t the action-packed sequel I’d been expecting, but it still does wonders for the series. The characters come more to life and forge a greater bond between readers. Amanda Hocking’s Watersong series is only at its beginning, but readers are wise to not miss out on what is sure to be a fantastic series! See my review of WAKE & interview with Amanda Hocking! Read an excerpt of Lullaby!